Hamas has the same ideological outlook as the Islamic State; it, too, aims for the creation of a global Islamic caliphate. Hamas, however, espouses a phased approach that leaves room for diplomatic activity. The fear of Hamas’ military option, its leader Khaled Mashal believes, spurs international actors to court Hamas and try to bring it into a dialogue process that will restrain it. The Hamas leadership is pleased with the talks with international emissaries, most recently former British Prime Minister Tony Blair. Hamas, assured that the path of terror and violence pays off diplomatically, is raising the bar of its demands in return for a truce in Gaza while continuing to fight Israel in the West Bank. 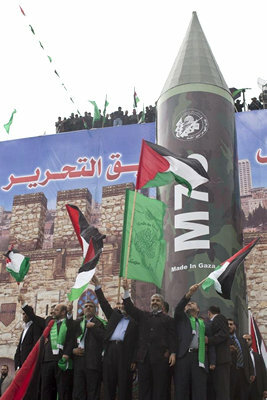 Khaled Mashal with Hamas leadership and a mock-up of Hamas’ M-75 rocket in 2012. In an interview to Al-Arabi al-Jadeed on August 22, 2015, Hamas leader Khaled Mashal gave the main points of his movement’s policy, which combine tactical pragmatism that makes use of diplomacy with an uncompromising ideological stance and the use of warfare and terror to promote political goals. In Mashal’s view, Hamas remains a powerful force because it is undeterred and capable at any time of instigating a military clash with Israel that will affect Middle Eastern stability and create shock waves even in European countries. It is the fear of its military option, Mashal believes, that spurs international actors to court Hamas and try to bring it into a dialogue process that will restrain it. Hamas has the same ideological outlook as the Islamic State; it, too, aims for the creation of a global Islamic caliphate. Hamas, however, advocates a phased approach that leaves room for diplomatic activity. In the current stage, Hamas seeks primarily to translate its success in establishing self-rule in Gaza, functioning as a state, and achieving a deterrent capability toward Israel, into diplomatic gains and ties with European countries in particular. Mashal expressed satisfaction at the fact that three international emissaries – Nikolay Mladenov of Bulgaria, the UN’s top Middle East envoy; Robert Serry of the Netherlands, the UN’s Special Coordinator for the Middle East; and former British Prime Minister Tony Blair – have turned to Hamas and held talks with its leaders in an effort to promote the contours of a long-term truce. In Hamas’ view, this is proof that the path of terror and violence pays off diplomatically, and as a result Hamas’ demands know no limits. Mashal declared that Hamas’ condition for a truce, one lasting a limited time only, is the solution of “all the problems” in Gaza: These include the full rehabilitation from the damages suffered in the latest war in the summer of 2014; the lifting of the blockade and the opening of the border crossings with Israel and Egypt; the payment of the salaries of 50,000 public-sector workers who were appointed during Hamas rule; the building of a seaport and airport in Gaza; and the development of its water, electricity, road, and sewage infrastructures. These are not the terms of a defeated terror organization striving in any manner to survive, but of the leadership of a terror organization that is ruling unhindered over a strip of land and that believes it has the power to dictate terms by threatening violence and sometimes carrying out the threat when circumstances are right. The basic endeavor with regard to putting an end to the occupation will remain the same. However, we must focus at present on a solution to the problem of Gaza, an urgent issue that cannot be deferred. At the same time, our national endeavor is more far-reaching. Our national endeavor is the liberation of the land, the restoration of Jerusalem and the Al-Aqsa Mosque and the holy places of Islam and Christianity, the implementation of the right of return, and the establishment of a Palestinian state on our land. We are open to the Arab, Islamic, regional, and international efforts….And we will behave positively toward whoever proposes a solution to the problem of Gaza, so long as it does not come at the expense of the national interest, and of the basic national principles, and of the rights of our people, and of the unity of Gaza and the West Bank as a Palestinian national unity within the framework of the Palestinian Authority and the PLO. Hamas’ main objective is to wrest control of the PLO, which is internationally recognized as the official and sole representative of the Palestinian people. Moreover, Hamas has been prepared to forge reconciliation agreements with the Palestinian Authority and Fatah, and it keeps demanding the formation of a new, temporary leadership for the PLO Executive Committee that will include Hamas and Islamic Jihad as a first step toward new elections for the PLO and PA institutions. That objective provides a further motivation for Hamas to seek a breakthrough in relations with the West and to market itself as the cardinal actor in the Palestinian arena, one capable (ostensibly) of diplomatic pragmatism. The unilateral measures of the Fatah leadership (the resignation of the Executive Committee members and the turn to new elections for the Palestinian National Council without coordination or inclusion of Hamas) have sparked fury in Hamas, and will probably boost those who favor escalating the fight against the Palestinian Authority on the West Bank in an effort to undermine its rule.